There is much to enjoy here and the works that I especially enjoy include the Bartók’s gratifying Romanian Folkdances - a set of six piano pieces from 1915. They are arranged here for flute and guitar by Arthur Levering. With the guitar often taking the supporting role the highlights are the exuberant Brâul, the meltingly attractive Pe loc with its exotic Middle-Eastern flavour and the rustic Buciumeana so evocative of Slavic folk-song. Ravi Shankar’s L’Aube enchantée is based on the Hindustani raga todi and firmly holds the attention. This fascinating score inhabits an unusual sound-world that feels as if electronic instruments and drums are being used. Handel’s appealing Sonata, originally for recorder, abounds in a variety of dance-like rhythms. A much more recent score from 1991, Elliot Carter’s Scrivo in Vento for solo flute engrosses from first to last. The final work is Piazzolla’s highly appealing Histoire du Tango, a four movement piece from 1986. It’s vibrantly coloured and is alive with foot-tapping rhythms. 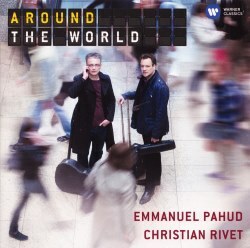 The finest flautist of his generation, award-winning Emmanuel Pahud demonstrates immaculate breath control, displaying stunning articulation and attractive timbre. Christian Rivet plays throughout with an assurance and virtuosity that comes only from mastery of his instrument. The engineers have provided close, warmly coloured sound, clear and delightfully balanced. It would be hard to imagine better advocates for these works. To widen the disc’s general appeal I would have included something much more familiar for the solo instruments such as the Debussy Syrinx for the flute and maybe Granada from Albéniz’s Suite Española or the Andaluza from the Granados Danzas Españolas. With regard to English music of an undemanding nature it would have been a real bonus to hear Pahud play Malcolm Arnold’s Fantasy for Flute and for Rivet the Fantasy for Guitar and William Walton’s Five Bagatelles. The two could have collaborated over Arnold’s miniature Fantasy for Flute and Guitar. For music-lovers looking for something different to the customary offerings yet remaining highly attractive this Warner Classics release fits the bill splendidly.